Although the short legged cats from Europe seem to have disappeared, the trait reappeared in New England in the 1970's and in Louisiana in the 1980's. From a pregnant black female (since named Blackberry) short legged cat found by Sandra Hochenedel living under a pickup truck in 1983. In her first litter and in each subsequent litter, Blackberry passed the trait of her short legs on to about half her kittens. One of Blackberry sons, Toulouse, was given to a friend named Kay LaFrance who established a colony of Munchkins on her Louisiana Plantation. The present Munchklns are descendants of Blackberry and Toulouse, although Munchkins have been sited throughout North America and the world. At the present time, the Munchkin appears to come in every sort of body type, head type and coat length. the only thing these cats have in common is their extremely short legs. Since the "gene pool" is unlimited, there are no clear guidelines as to what type the Munchkin will ultimately resemble. Some Munchkin breeders are mating to Persians, others to Siamese and still others to Abyssinians. At present it is not possible to present a picture of the ultimate type, apart from its distinctivly short legs. The short legs do not seem to affect its climbing ability, but its jumping ability is limited by the shortness of the hind legs. Due to its lack of jumping abilities the Munchkin can find it very difficult to escape from fights with other animals. A Munchkin should therefore be an indoor only cat. Since the Munchkin has so many different ancestors, its temperament will depend largely upon which cats are on its pedigree. As with any cat, the conditions under which it is raised and the amount of attention given during kittenhood are also factors in the temperament. Munchkins have kitten-like personalities, and they keep their kittenish ways all their lives. They are very affectionate and love to be around adults, children, dogs and other cats. They never tire of human company and prefer to be with a companion or two rather than alone. Munchkins also enjoy the company of other animals and adapt well to most circumstances. They are not aggressive cats, but are very social and out-going. Munchkins are very playful, they love to run, chase, climb and play with toys. When it comes to chasing, their short legs give them an advantage over cats with long legs. Those little legs allow them to scramble faster and corner sharper. They love to scurry after ping pong balls, mice on fishing poles and live bugs, if they get the opportunity. This is the cat who may well be collecting all your little jewels and nicknacks, just like the Magpie, and hiding them under furniture. They readily accept a harness and leash and seem to enjoy taking their owners for walks. Being a relatively new registered breed of domestic cat with short legs. The gene responsible for shortening the long bones in the cats legs is a natural mutation. It does not cause any mobility or spinal problems. 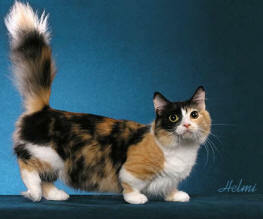 Munchkins should be a medium sized cat, not appearing to resemble a miniature version of a purebred. Available in long or short hair, and in all colours.